A great tour for couples or the whole family! Experience the lush tropical waters of Maui, as you glide into a beautiful ocean shore marked with the unforgettable Pacific ocean breeze. Our Segway PT shore tour includes the Hanakaoo Beach Park also known as canoe beach and Wahikuli State Park. Glide with us through “Canoe” beach park also known as Wahikuli park a long border uninterrupted stretch of golden sand between Kaanapali and Lahaina. This beautiful area have been in existence long before Maui became a chic vacation destination and long after the capital of Hawaii was moved from nearby Lahaina to Honolulu on Oahu. A path connects the southern end of Hanakaoo Beach Park with Wahikuli State Park. This Segway PT tour follows the walking path through both beach parks past grassy picnic areas and shady Ki awe and palm tree groves. With easy access from Lahaina or Kaanapali and excellent beach, BBQ and picnic facilities, the parks are popular swimming and snorkeling. Very nice family friendly area with a wide and expansive sandy beach. Hanakaoo beach park has very calm water in the early hours of the morning, and it is an excellent location to see giant sea turtles (honu) when snorkeling close to the shoreline. Enjoy late afternoon to see island canoe clubs do their daily workouts and see the old plantation cemetery next door. Take a photo of stunning sunset views and a clear sight of the Hawaiian island of Lanai. 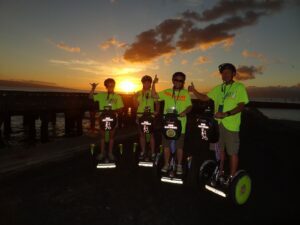 Take stops and snap photos of your Segway PT Lahaina Ocean View tour and take some precious memories back with you. Select your favorite photos from your tour and let us print and frame them for you. We take and print high quality digital images with high quality equipment or purchase all high quality pictures on CD or USB. Get HD video from your tour on a DVD or Blu-Ray, we add Hawaiian music and special footage to your disc. John, the ultimate Segway tour guide, made our tour fun, safe, informative, exciting and positive for newbies and experienced riders of all ages. The guy’s passion for his job translated into an awesome ride far exceeding our expectations. If this activity interests you at all, try it here, with John. Mexico, Europe, Grand Turk, the U.S.A., none compared. From the moment we were greeted by Mark and Pat we knew we were in great hands. First an informative video, then extensive “on-seg” training on adjacent parking lot, and we were confidently ready to go. Mark was our extremely knowledgeable and safety conscious guide coupled with a lively sense of humor and excellent skills as trip photographer. We can’t wait to do it again! DJ and Bill, Minnesota, golden agers.